050418 - Senator Elder Vogel, Jr. 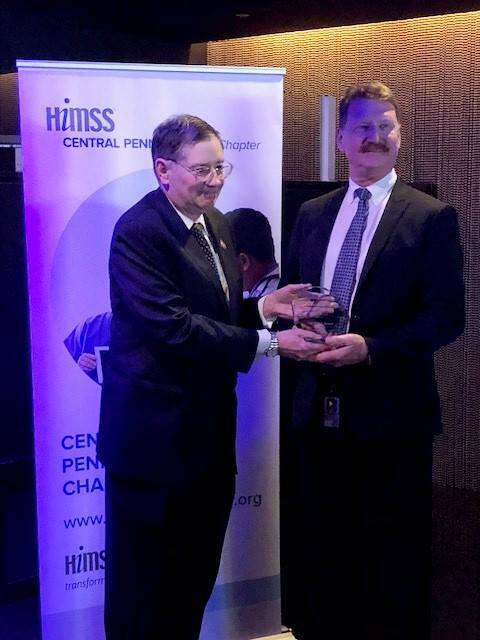 I was honored to receive the Legislator of the Year Award from The Healthcare Information and Management Systems Society for my work advocating for the Telemedicine Act. I was pleased to join other elected officials last week in urging Governor Wolf to push the Department of Environmental Protection (DEP) to formally petition the federal Environmental Protection Agency to lift the “summer gas” mandate that drives up the costs of gasoline for western Pennsylvanians. Time is of the essence as further delay from DEP will result in local gasoline suppliers stocking up on the costly low Reid Vapor Pressure (RVP) gasoline which would then be sold at higher prices at the pump. Since 1998, the state Department of Environmental Protection and federal Environmental Protection Agency have required that gasoline sold between May 1 and September 15 in the seven-county Greater Pittsburgh Area have an RVP of 7.8psi. Regular gasoline has an RVP of 9.0. Since that time, ethanol became mandated by the federal government, increasing the RVP value of fuel. This resulted in an exclusive “boutique” fuel mandate for southwestern Pennsylvania. I have been fighting for years to finally see this mandate come to an end. My legislation, Act 50 of 2014, started the process for the elimination of the statutory requirements for RVP gasoline in Allegheny, Armstrong, Beaver, Butler, Fayette, Washington and Westmoreland Counties during the summer months. This “summer gas” is routinely more expensive than gasoline sold in the rest of Pennsylvania and also in neighboring Ohio and West Virginia. In order to avoid another unnecessary summer of fuel price hikes, we requested that Governor Wolf have DEP take any and all actions necessary to immediately submit the SIP (State Implementation Plan) to the EPA and formally request suspension of this unnecessary regulation through whatever waivers or notice may be needed. The state is eager to avoid increasing gasoline prices for all residents of western PA and we have been dismayed at how long it has taken DEP to formally submit this request to the EPA. The roughly 2.5 million residents of Allegheny, Armstrong, Beaver, Butler, Fayette, Washington and Westmoreland counties would certainly appreciate any and all efforts to provide relief of any more ‘pain’ at the gas pump this summer than is already being inflicted. Earlier this month, we also wrote a letter to the EPA Administrator Scott Pruitt urging his agency to quickly approve the change and ensure adequate gasoline supplies through the transition to a summer specification fuel. If you have any questions or want more information, please contact my office at 724-774-0444 or visit my website by clicking here to read the letter. The Beaver County District Attorney’s Office, the Beaver County State Legislative Delegation and the Community College of Beaver County (CCBC) presents “Preventing Theft in your Nonprofit Organization” a free public program on anti-fraud and best practices for volunteer and nonprofit organizations. The program will be held on Wednesday May 16, 2018 from 6pm to 8pm at 1 Campus Drive Monaca, PA 15061, CCBC Health Science Center Room 6010. The featured speaker will be Fred Croop, a respected professor of business at Misericordia University. He will discuss best practices and fraud prevention. Dr. Croop developed the Internal Controls and Federal Tax Exemption Basics for All-Volunteer Organizations Resource Manual with his business students in 2015. At the request of the Pennsylvania Department of Community and Economic Development (DCED), Dr. Croop also developed the Financial Management and Internal Controls Guide for Volunteer Emergency Services Organizations. Soon, all volunteer organizations will be required to follow the guide in order to be eligible for grant funding from DCED. Dr. Croop will review the guide and will answer questions after the seminar. Please RSVP by May 10th at the District Attorney’s office by calling 724-773-8550 or email cklindauere@beavercountypa.gov. For more information please call my office at 724-774-0444. 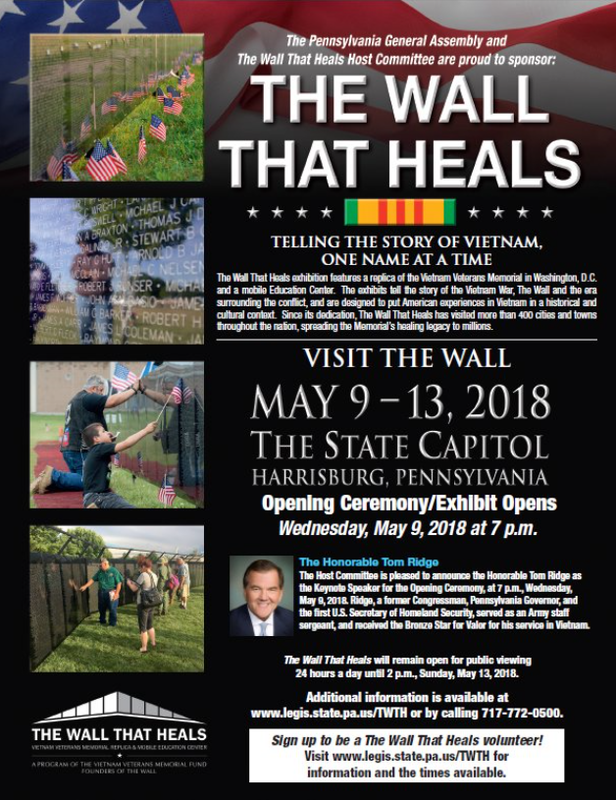 “The Wall That Heals,” a scaled replica of the Vietnam Veterans Memorial in Washington D.C., and mobile Education Unit will be open to the public from May 9, at 7:00pm (opening ceremonies) through Sunday, May 13, at 2:00pm (closing ceremonies). It will be situated on the South Lawn directly in front of the Irvis Office Building. Vietnam veterans and members of the public are invited to attend the Opening Ceremony, at 7 p.m., Wednesday, May 9, 2018. The exhibits tell the story of the Vietnam War, The Wall and the era surrounding the conflict, and are designed to put American experiences in Vietnam in a historical and cultural context. The Pennsylvania General Assembly is proud to sponsor The Wall That Heals to honor those who served. Please click here to visit the Wall’s website. Repeat DUI offenders would face tougher penalties under legislation recently approved by the Senate. Senate Bill 961 increases the penalties for a person who unintentionally causes the death of another person as a result of a second or subsequent DUI violation. The bill increases the grading of subsequent DUI crimes and levies harsher sentences against repeat offenders who cause the death of another person. There were 10,256 alcohol-related crashes and 297 alcohol-related fatalities in Pennsylvania in 2016. Senate Bill 961 increases the minimum term of imprisonment for a person who unintentionally causes the death of another person while intoxicated from three years to five years if the person has a prior DUI, and from three years to seven years if the offender has two or more prior DUIs. The measure also increases sentencing provisions for offenders who are not properly licensed or under suspension. The current penalty is a fine of $500 and imprisonment of 60 to 90 days. Senate Bill 961 increases the penalty on a second offense to a fine of $1,000 and imprisonment of at least 90 days. A third or subsequent offense would result in a fine of $2,500 and at least six months in jail. Senate Bill 961 now goes to the House of Representatives for consideration. If you have any questions or want more information, please contact my office at 724-774-0444. Under a measure unanimously passed by the Senate, local school districts and governments would be permitted to discuss school security matters in executive sessions, which are closed to the public. In response to recent incidents of school violence across the country, many Pennsylvania school districts are reviewing and strengthening their institutional security plans to better protect students, a process that may include identifying potential weaknesses in their current plans. If made public, this information could compromise school safety efforts and put students at risk. More than half of the states in the U.S. currently have measures in place which allow for security and safety matters to be discussed in non-public executive session. 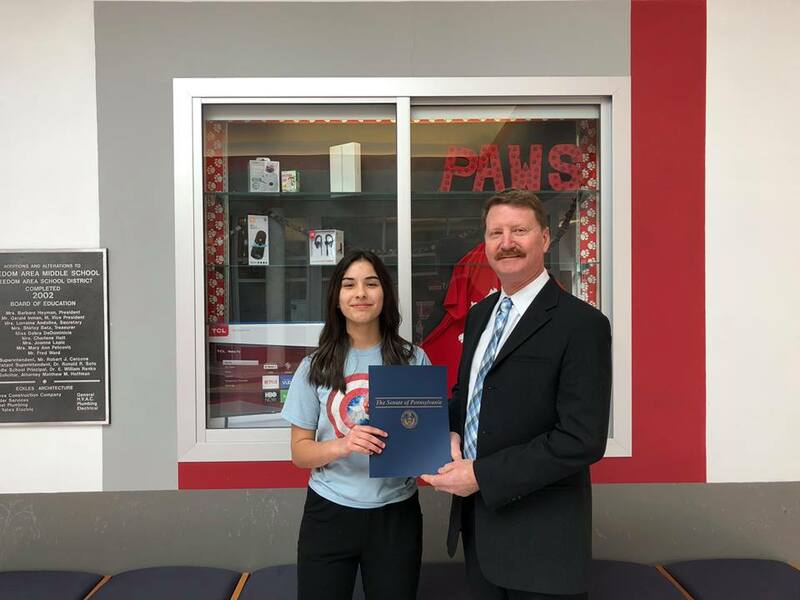 Congratulations to Norina Baker from Freedom Area Intermediate Middle School in Freedom, Beaver County, has finished in third place in the “Talk to Your State Senator” statewide video competition. The competition was launched to get middle school and high school students involved in legislative efforts to fight heroin and opioid abuse. It was sponsored by the Senate of Pennsylvania, with support from members of the Drug and Alcohol Service Providers Organization of PA.
Students from around the state submitted video entries highlighting ways to combat abuse, help those who suffer from addiction, and develop laws to address the growing crisis. Videos were judged based on creativity, content and effectiveness of message delivery. I’m so pleased that an entry from our area was selected, and very proud of the hard work and creativity that all the students showed in their videos. The legislature has been actively seeking input on how we can combat this health crisis that is quickly growing in our communities at an alarming rate. This contest has enabled us to enlist the help of young people in our schools who have witnessed first-hand the negative impact that drugs can have on individuals. Miss Baker will receive a $1,000 award, which will be deposited into a TAP 529 college savings account in her name. To view the video and all other winning submissions, go to www.acommonwealthcrisis.com. 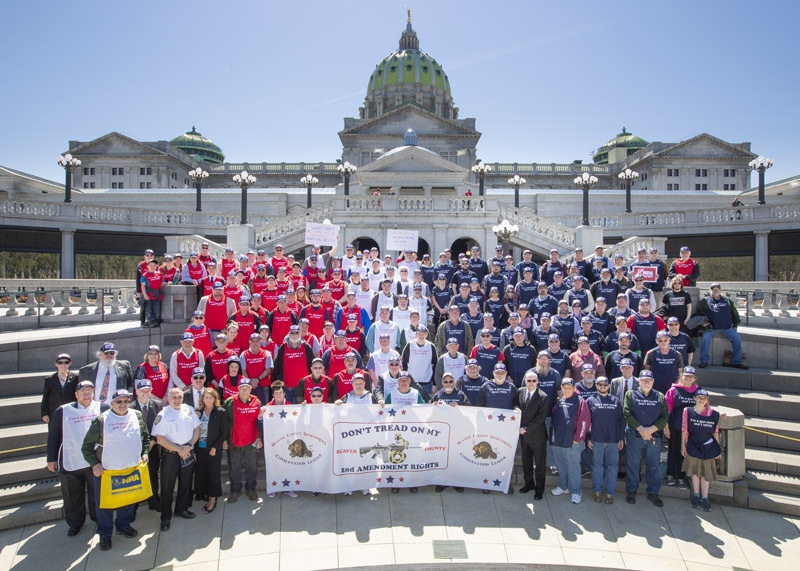 I was happy to see so many people from Beaver, Lawrence and Butler Counties attend the annual Rally to Protect Your Right to Keep and Bear Arms Rally in Harrisburg on April 30th. The Office of Commonwealth Libraries is now accepting applications for the 2018 Keystone Grants for Public Libraries program. These grants are funded through the Keystone Recreation, Park and Conservation Fund. A competitive grant application process is used to award matching grants to municipalities that sponsor state-aided public libraries. These grants may be used for planning, acquisition, construction and rehabilitation of public library facilities as outlined in the General Guidelines. To be eligible, the sponsoring municipality and the board of the state-aided library must jointly submit an application developed cooperatively by both entities and signed by their governing bodies. The maximum Keystone grant award is $750,000 and requires a dollar-for-dollar match. Applicants must show matching funds on hand at the time of the application. There is no minimum amount that may be requested. Applicants must submit a complete application to the Office of Commonwealth Libraries, postmarked on or before June 15, 2018. The Office of Commonwealth Libraries expects to notify applicants by early September whether they have been awarded a grant. You can find the Application and related Keystone information by visiting the website of the State Library of Pennsylvania [www.statelibrary.pa.gov] and clicking the For Libraries link, then Subsidies and Grants, then Keystone. Click here to access the Keystone grant documents via the State Library website. Please send any questions about the Keystone Grants for Public Libraries process to RA-Keystone@pa.gov or call Ed Lupico at 717-783-5747. May 8th is the deadline to request an absentee ballot for the May 15 primary election. Ballots must be returned to the county election office by May 11th. Absentee ballots may be cast by deployed members of the military, Pennsylvania students attending out-of-state colleges or universities, individuals with illnesses or disabilities, and individuals who will be away from their municipality on business on Election Day. Request forms and more information by clicking here. 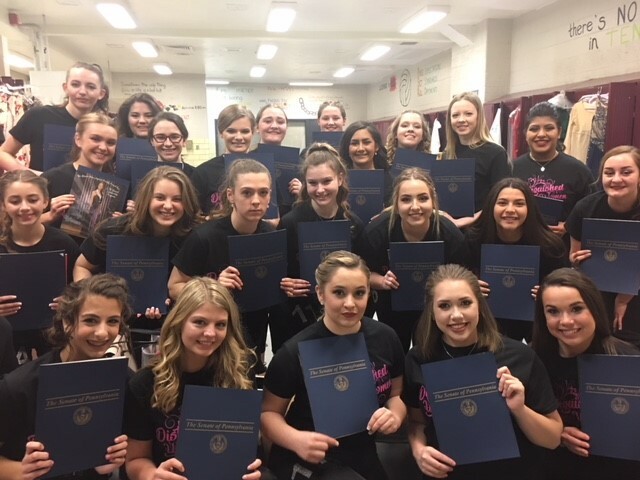 My office and Senator Bartolotta’s office were happy to prepare certificates for the 24 finalists in the 57th Annual 2019 Beaver County Distinguished Young Women Scholarship Awards. The program is sponsored by the Beaver Area Jaycees and was held at Beaver High School, April 21, 2018. This event will be held for children 9 to 16 years old. There will be prizes throughout the day and a lunch will be provided. For more information, please contact Jerry Hooks at 724-601-6964.